I smiled when I saw the title of your post. Yes, I’ve eaten SPAM – I’ve even GRILLED it on the grill, and it was good! I have noticed the unwelcome spam recently; it’s annoying. I’m so thankful for the spam filter that WP offers! Have a good day, MJ – hope it’s spam free! Yes I def remember spam!! I ate it as well! I’ve noticed the spam on WordPress too, I was confused when I clicked on blogs that didn’t exist! Crazy. Never liked spam, canned or e-version. I have new subscribers without “real” blogs. I am careful to not approve suspicious commenters for fear they will get on without my review next time. Seems like whenever there is a fix for one version a new version slightly different pops up. Yes, I’ve noticed the same thing–their inability to express a coherent thought is a dead giveaway. 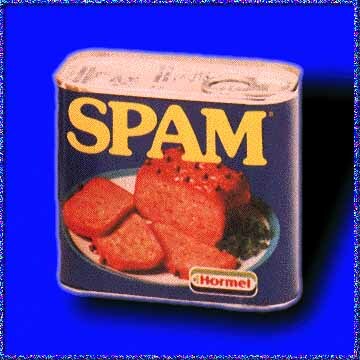 I didn’t like Spam when I was a kid, and I like this new version even less. I do not like this Spam I am! Sadly, yes. I fear that WP is going to have to install some sort of captcha for certain things (blog follows, first comments to be approved) or they’re going to end up completely swamped out. I always looked forward to spam sandwiches. My mom would fry up some slices in a skillet and then melt some cheese on top of them. Those would go on a big kaiser roll with a lot of mustard. A little bit of childhood heaven right there! spam sandwich with cheese and mustard? Oh yeah! I think the WP spam catcher is pretty good b/c it seems to catch all the crud that tries to sneak in under the door! These spam mails are machine written. Phrases and sentences are generated by some kind of alogrythyum. The safest thing is NOT to visit the links out of curiosity. Just visiting some sites can be dangerous. It seems that when we visit a website we are merely looking at it – like on TV – but that’s not the case. We actualy download the information – and with that information can come little electronic nasties. They have little files called trojans, that get downloaded onto your machine which trace every single keystroke ou make. That’s your bank details or your passwords. you raise some good points, thank you for that, Bill! WordPress does a great job of filtering out the spam and I am always grateful for that. I don’t pay much attention other than to take a look and permanently delete those comments when I think to do so. I HAVE noticed more new subscribers lately. Now I’m wondering if they’re legit! hmmm…how do they find us? I’ve been wondering if perhaps the new recommended feature to the right of our reader helps them find us. Not too much, but a steady diet, nonetheless.